Yesterday my sweet baby Kinley turned 20 weeks old. 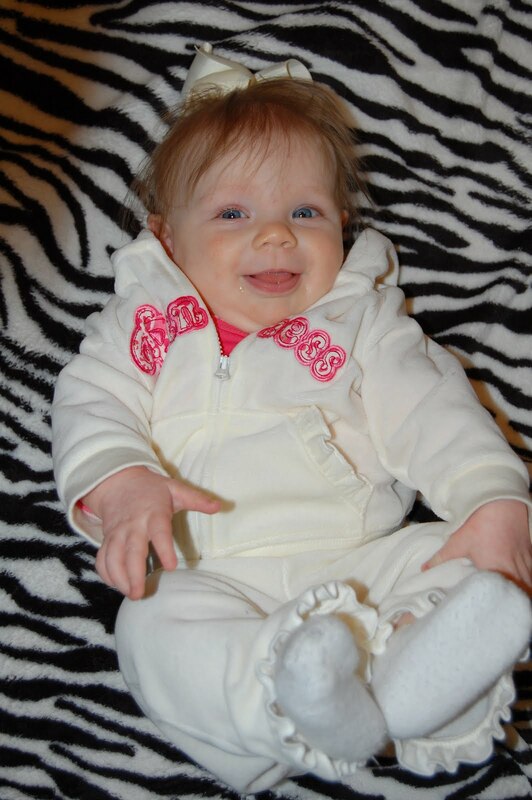 She had her RSV check up on Valentines day and she got a really good report, thank the Lord! She is now only having to do her breathing treatments every 4-6 hours!!!!! 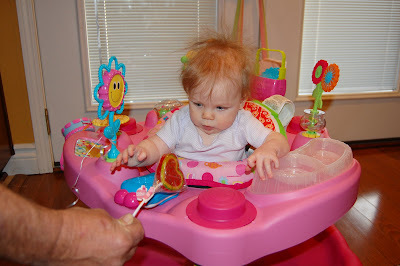 My cutie pie with her WILD hair;ha! ( Thanks for the cute outfit Ms. Shannon!) Over the last two weeks Kinley has been sitting up for a few seconds at at time, but Thursday night (out of nowhere) she started sitting up for long periods of time all by herself. It tickles Micah Claire that Kinley can sit up just like her. 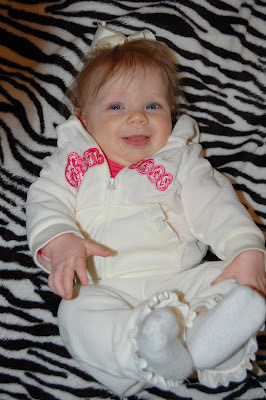 Aunt Ash and Uncle Eric got Kinley some super cute personalized passies for Christmas. 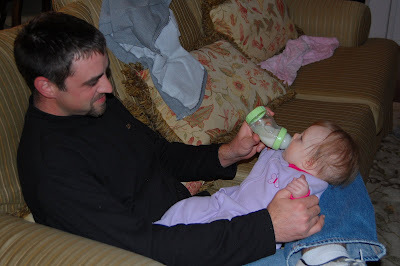 We had so much trouble trying to get her to take a bottle I didn't want to introduce a new type of passy too. 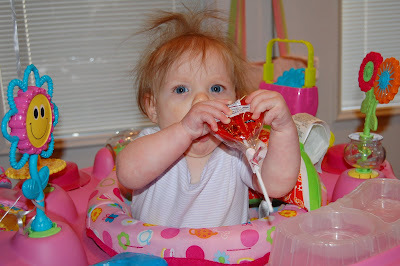 But now that she is taking a bottle like a champ, we can now use our new passies! 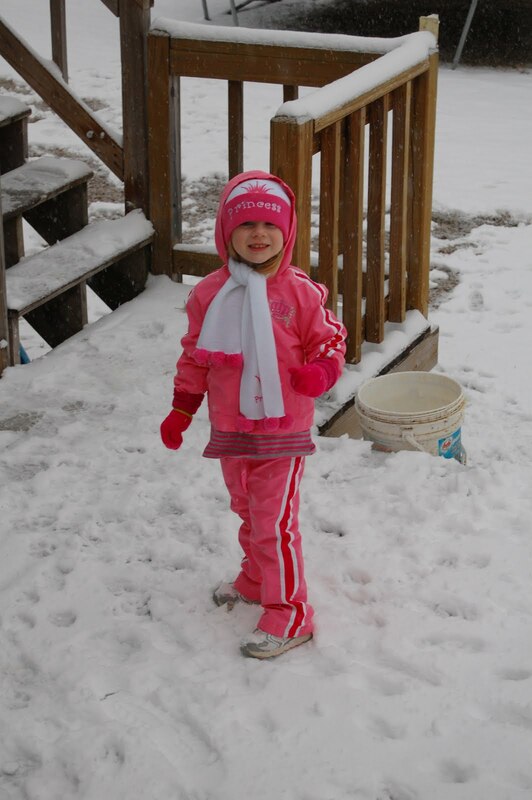 Here she is sporting the pink one. And these are the purple and blue ones! TOO CUTE! Today was beautiful! It was sunny and 75 degrees with a slight breeze and we couldn't not play outside!!!! 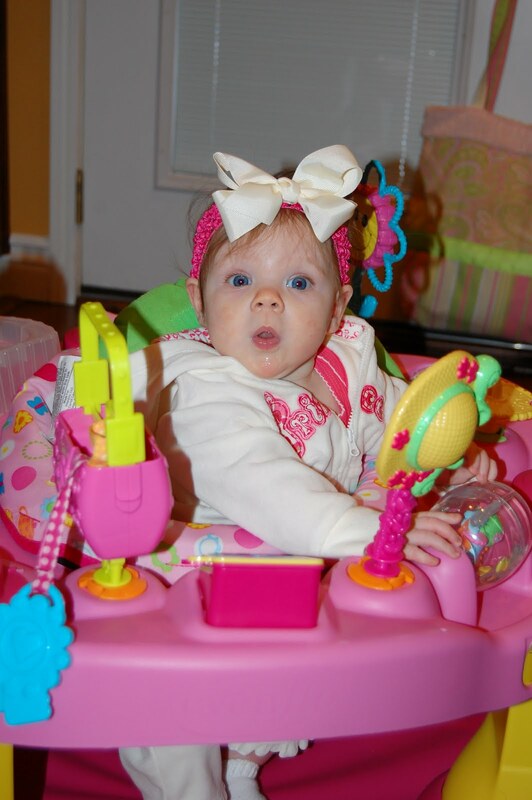 Kinley LOVE IT!!!!!!!!!!!! This is her first time to really spend an extended amount of time outside and she did GREAT!!!!!!! I LOVE this picture! She is talking up a storm these days. Between her and Micah Claire, there is hardly ever a quite moment in our house! Such a happy girl; we are so blessed! And this picture just makes me melt. 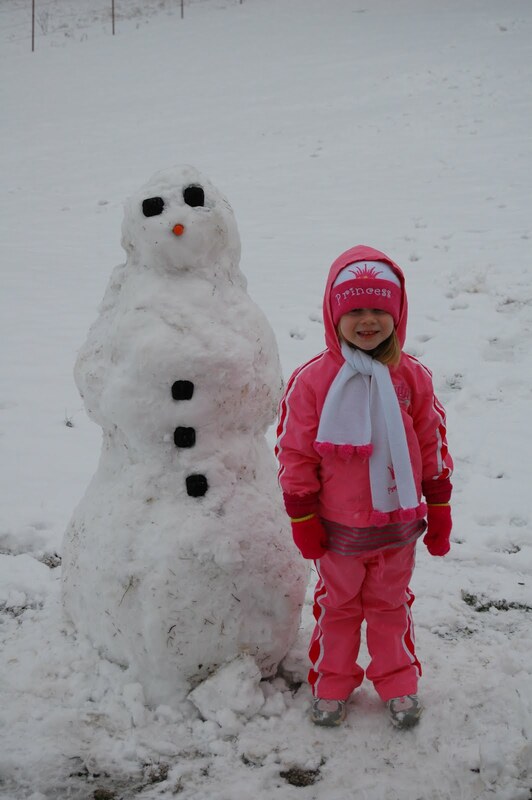 Love you Kinley Bugs! PRECIOUS!!!!!! Micah Claire was beyond excited when she was allowed to wear her flip flops today.... she's been waiting for this day since we retired them in October! Lovely picture! Now that's how you know you played hard; LOL! 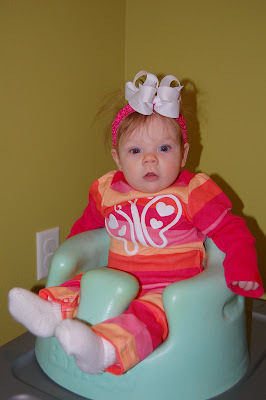 Monday, Micah Claire had her first ValenTimes (as she says) party at school! Kinley had her follow up Dr's appointment & M.C. was super sad that we couldn't come. She couldn't wait to get to school and start partying! She was super pumped to show me the ValenTimes box she decorated! She pulled out each ValenTime one at at time and showed me each one of them! She got a ton of stickers and tattoos! Kinley's appointment was over pretty quick so we showed up and surprised M.C! She squealed sooo loud when we walked in the door! 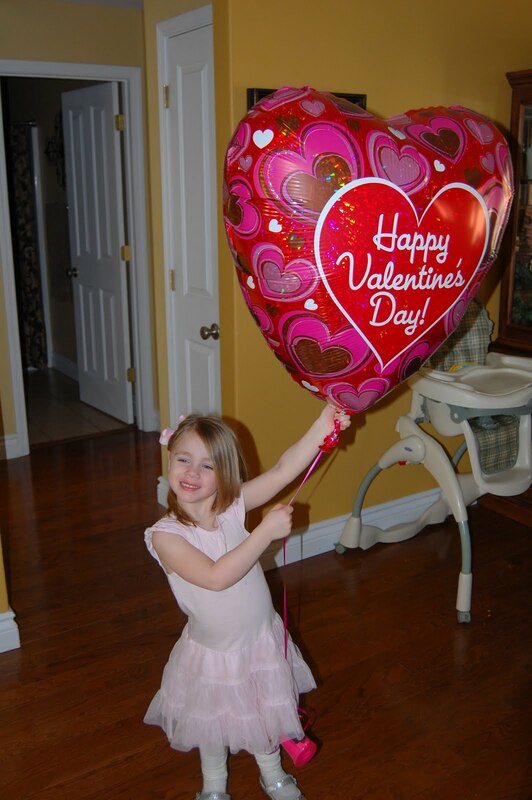 She LOVED the huge balloon and mommy & daddy sent her! And then Papaw Barry and Ms. Debbie showed up that night with even more balloons and she was in balloon heaven! Papaw even got Kinley bugs her very own heart sucker! And she loved it! Too bad it will be several years before she's allowed to eat it;lol! Two weeks ago, 2 babies at Kinley's daycare were dx with RSV.... and we thought we dogged the bullet. Well.... we were WRONG! Last Thursday night she spike a fever of 102.9 and was super fussy all night. When she went to bed she was wheezing and moaning like crazy and I knew something was wrong. Her 4 month check up was last Friday but it had to be rescheduled due to all snow, so luckily we had moved it to this Friday. So as soon as we get into the dr's office I tell them her symptoms and they test her for RSV (which was super fun!) It came back positive within a minute :( I immediately started crying. 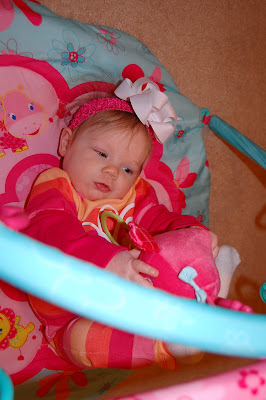 I couldn't believe it, my sweet little baby had this terribly scary virus. Dr. Rucker said it looked like we caught it right at the start and that was GREAT news! And of course RSV is going around so they were out of the electric machines so we had to do the treatments with a manual pump. Okay...we can handle that! Then came the rest of the check up and even worse news.... A LEFT EAR INFECTION!!!!!!! I MEAN WHAT!!!!!!!!!!! I almost feel out of my chair; I couldn't believe it. I told Dr Rucker that just couldn't be because 1) This baby is exclusively breastfeed and 2) she sleeps on her belly 100% of the time. She just laughed and told me those things just "help" prevent ear infections they don't' guarantee your child will never get them.. UHHHH! Okay, so now I'm feeling like a terrible mother! My first child had a private baby sister and never got sick and has only had 2 ear infections and they were both over the age of 3!!!! This poor baby was put into daycare and is already sick.... Good Job Mom! I know it's not really my fault, but we as mother's always take the blame and feel 100% responsible for what happens to our babies. My sweet baby at 19 weeks with this ole yucky virus! 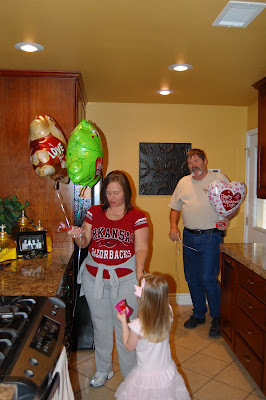 Daddy giving Kinley her stinky old antibiotic :( Aunt Ashley came over Friday afternoon to hang out with us! As you can see... Kinley LOVES her Aunt Ash! And even Uncle Eric came over when he got off work to hang with us! And SUPER wonderful big sis really kept Kinley entertained! Kinley just hangs on every word and movement that M.C. makes and it tickles me beyond belief!!! Kinley did great Friday and Saturday until 6pm. When she woke from her nap she wasn't a happy camper.... and it went downhill from there. Around 7:15 her breathing became so labor intensive. Then at times she was holding her breath and struggling to really get a good breath. So, we had Dr Rucker call us and she said to do another breathing treatment. That treatment helped till about 11pm. Then she started making the worst nosies (kinda sounded like she was barking like a dog) and she was gasping for breaths non stop. Shawn and I both jumped from the bed and ran out of the house with her! (Luckily we sent M.C. to spend the night with mom so we didn't have to wait on someone to come get her or take her to the ER with us). They have her another breathing treatment at the ER with some stronger meds and sent us home. Needless to say I haven't slept much since then. We had another check up first things this morning and Dr. Rucker said she was doing great and her ear infection had already cleared!!! Please say a little prayer that Kinley keeps better! 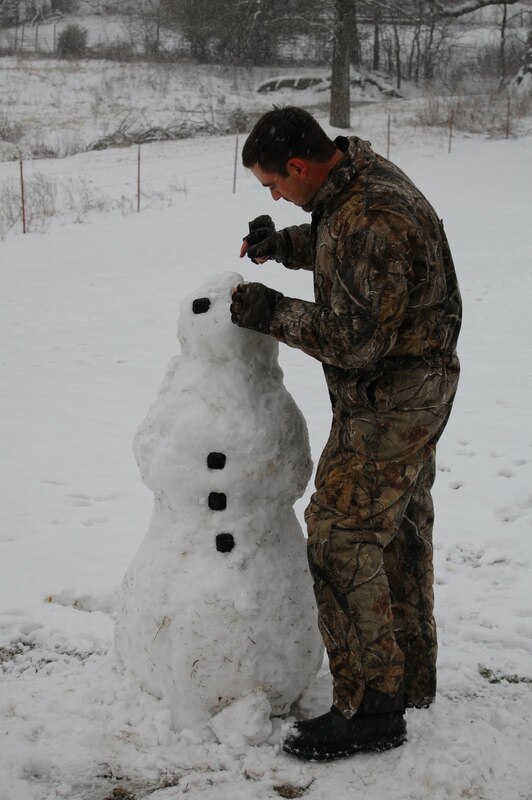 We couldn't just let Frosty melt away.... we had to send him out in style!!!! Sometimes in life things happen that make you stop, really stop, in your tracks and thank God for everything you have. Today, was one of those days. I got word that a friend lost her baby boy at 33 weeks gestation. I made me sick to hear this news. No one deserves to lose a child EVER; but this woman is truly a genuine, caring, loving, christian, wonderful woman who didn't deserve such a thing. I have no idea why God does things the way he does, and as I get older I've learned there is just no reason to even try and figure God's plan out. All I can do is pray for her and her family during this time and thank God for what I have. Today I counted all my blessings twice... if not more. Tuesday and Wednesday Ms. Kinley went ALL day long at daycare with NO BOTTLE! She came home and ate and ate and ate. Then she went to bed and was up every 2 hours to eat. I was breaking my heart to think that she was going 8-9 hours with no milk. So, Wednesday night we got desperate and tried everything and we FINALLY found a bottle she would take!!!!! Let me tell ya this baby downed 8oz at one time and slept like a rock!!!!!!!!!!!!!! But the true test was Thursday at school. They texted at noon to tell me she was on her 2nd bottle of the day; they couldn't believe it. They said they made all the workers come and watch and they were all in disbelief that she would take a bottle! My stress levels have no come down knowing that my sweet baby isn't starving all day long! Daddy was soooo happy to get to feed her; it's been 2 months since he's got to feed her! M.C. was even excited and she got a turn to feed her to! 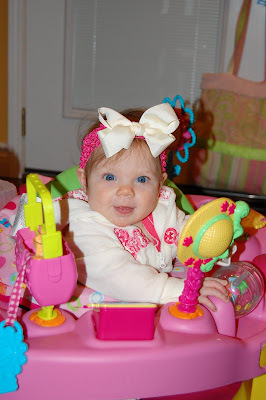 My sweet baby Kinley turned 18 weeks old today! She is really getting her own little personality these days and it is precious to watch! I LOVE this picture; it screams.... Whatcha talkin bout Willis! She LOVES her feet. If ya put socks on her, she's immediately pulling them off! It's almost scary that she's such a happy baby! I was running around getting ready for my class this morning and something caught my eye in the window. 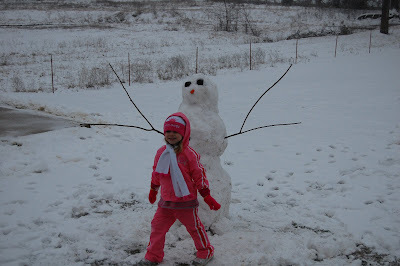 It was SNOW.... AGAIN!!!!!!! I couldn't believe it, it was everywhere. Don't get me wrong, I love snow but ENOUGH IS A ENOUGH!!!!!!!!!! Even M.C. wasn't really that excited by it this time; I think we're all a little burned out on it. And they are calling for more by the middle of next week; uhhhhhhhh! After nap time M.C. was finally ready to get out and play in the snow. While we were all napping, Daddy had been building his very first snowman! We think he did a GREAT job; thanks Daddy! M.C. 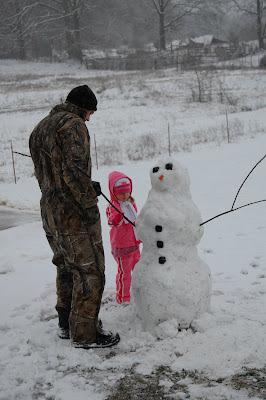 decided Daddy' snowman need a carrot nose! Micah Claire turned 41 months old today; I can't believe she will be 3 1/2 years old next month; it just doesn't seem possible. 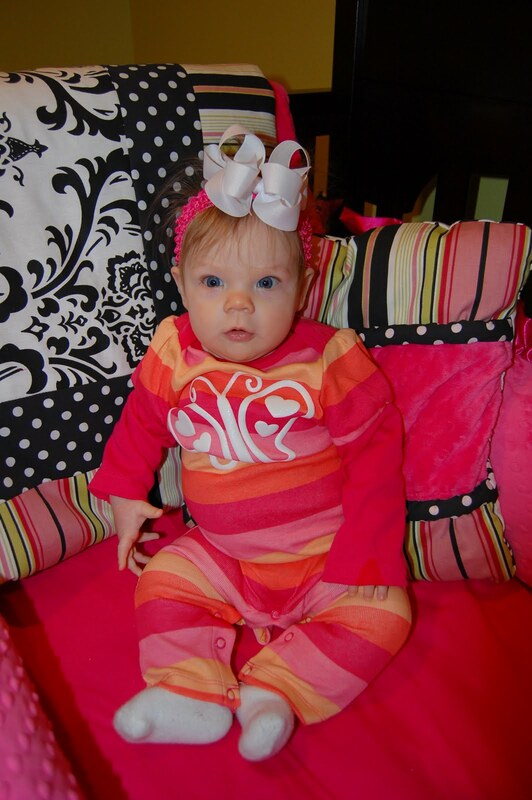 Sweet Baby Kinley you are 4 months old today! You weigh 15# even and is 25 inches long! 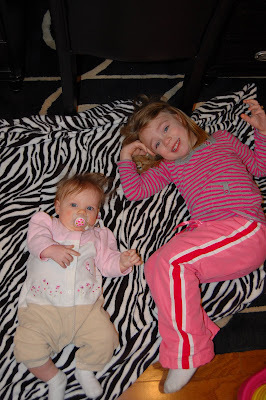 You are still wearing size 2 diapers, but you will soon be moving up to size 3! You babble and coo and squeal all the time. You now roll forwards and backwards. The other day you rolled over 3 times in a row and your sister yelled out.... Momma Kinley wont stop following me! 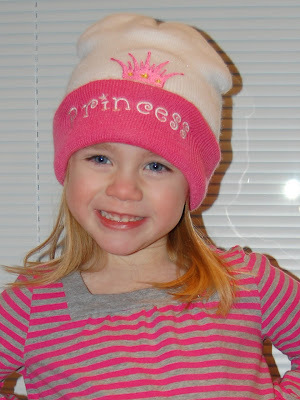 You love Micah Claire so much; she makes you smile and laugh all the time. You are still refusing to take a bottle at daycare but we are hoping you will give in soon and take one! You are trying to hard to sit up by yourself. I love that you are advancing so much, but it's breaking my heart to watch you grow up so fast! We love you with all our hearts, you have been a WONDERFUL addition to our family. You have added more joy and love to our family that we didn't know was missing till you came along! Our 4 month old! She looks like she has a lot to get off her mind in this picture;lol! 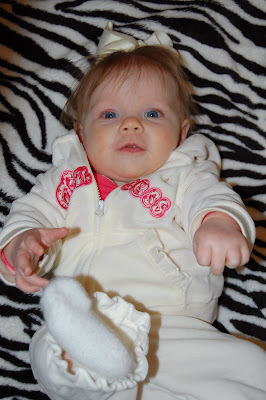 Kinley has found her feet this week and she loves them dearly! Once you are a fan just find the image of your choice and click "like" or comment under the image "like" or "vote"! !